Change your backyard, front yard or garden landscape with this fully-functional premium wagon. This buckboard wagon is Amish handcrafted from hickory and ash woods and finished with world-class care and attention to detail. This wagon is the perfect home for seasonal displays and garden essentials alike. Fill it up with Easter eggs, Thanksgiving pumpkins, Halloween decorations and more to bring festive fun to your outdoor space at any time of year. Additionally, this wagon is also available as a coffee table! Our craftsmen will add a layer of mirror or glass to the top of the wagon, transforming it into a statement accent table. Simply select your preferred surface from the menu above. 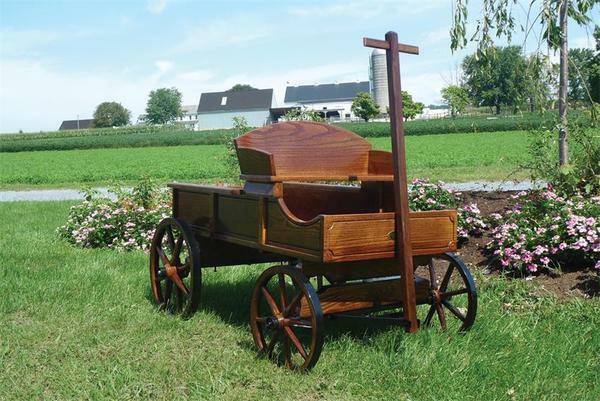 Choose from a wade variety of finishes to complete the look of your authentic Amish wagon. Please get in touch if you have any questions at all - we would love to hear from you. The wagon came today!!!! It is gorgeous! I love it! !